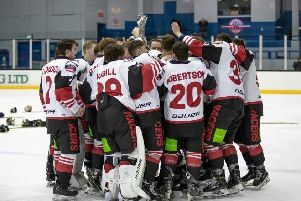 Murrayfield Racers progressed to the Scottish National League play-off finals, to be held this weekend at Dundee Ice Arena, in what can only be described as farcical fashion, beating Solway Stingrays 30-0 in their play-off quarter-final at Murrayfield tonight. Experienced Racers’ player/assistant coach Martin Cingel lead the rout with seven goals. Racers, regular season league champions, were no match for Stingrays who finished eighth in the nine-strong league, the match only highlighting the lack of depth in what is the top level of amateur ice hockey in Scotland, and fans will be hard pushed to remember a contest so one sided in Murrayfield Ice Rink’s 65 year history – although spectators gave the visitors a rousing ovation as they left the ice, for whom 16-year-old British women’s league star, Megan Gourlay, won player of the match. SNL Chairman David Hand was in attendance, and admitted the league were looking at the possibility of changing the play-off format for next season. Hand said: “We’ve had a few meetings with the clubs and my committee already this year looking to see what we can do in the future. “Next week we’ll be announcing a new team that will be joining the league, which brings us back up to ten teams again and this will hopefully rejuvenate the league a wee bit. “I feel the top six teams can play each other comfortably week in week out, but the others have a bit less ability and it’s difficult for them. It’s definitely something we’ll look at in the summer to see if we can make these games a lot closer, but you have to take your hat off to the Racers, they played well.